Ms Deeksha received a demand payable in intimation under section 143(1) from Income tax department. Help her in understanding what is intimation under section 143(1), why it is sent to her and how can she respond to Income tax department? After Filing of your Income tax returns, Income tax department carries out a preliminary assessment of all the returns filed and intimate taxpayers the result of such preliminary assessment. Such intimation to the taxpayers post preliminary assessment is called Intimation under Section 143(1). While processing the ITR, the tax department determines the sum payable or the actual amount of refund after making the following adjustments, an intimation shall be prepared or generated and sent to the assessee. The Intimation shall specify the sum determined to be payable by or the amount of refund due to, the assessee. An incorrect claim, if such incorrect claim is apparent from any information in the return. The Intimation shall specify the sum determined to be payable by or the amount of refund due to, the assessee. An intimation shall also be sent to the assessee in case where the loss declared by the assessee is adjusted but no tax, interest or fee is payable by, or no refund is due, to him. Where there is neither any adjustments nor any tax due from or refund payable to assessee, the acknowledgment of the return shall be deemed to be the intimation u/s 143(1). The intimation will be sent to person regarding the same via email and SMS under section 143(1). How to respond to Intimation u/s 143(1) in case of Demand Payable? If the assessee agrees with the demand , then he/she will be required to pay the amount of tax as per the intimation u/s 143(1) . The taxes can be paid through bank or online payment. According to the current income tax laws, the time limit to respond to this is 30 days. If person do not respond to the notice within the stipulated time period, the department can take action against person. if you are able to identify the mistakes you have made while filing your return from the intimation, and they can be rectified by filing a revised return. if there is no mistakes and you do not agree with the adjustments made by CPC, you can file an online rectification application under Section 154(1) intimating the correction of mistake appearing in the Section 143(1) intimation. Sometimes there may be a mistake in any order passed by the Assessing Officer. In such a situation, mistake which is apparent from the record can be rectified under section 154. 1. 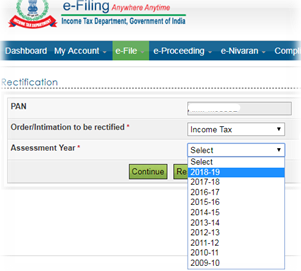 Login to your Income Tax e-filing Account. 4. Select the ‘Rectification Request Type’ based on the reason for filing rectification. 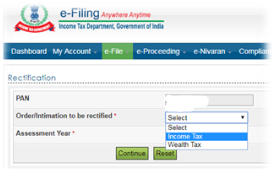 ‘Tax credit mismatch correction only’ − on selecting this option, three check boxes, TCS, TDS, IT, are displayed. You may select the check-box for which data needs to be corrected. You can add a maximum of 10 entries for each of the selections. No upload of an Income Tax Return is required. ‘Return data correctional xml’ – The taxpayer is correcting data for rectification. Several reasons are displayed. You can select a maximum of 4 reasons. After selecting the reason you will be required to select the concerned schedules to be changed in the rectification, an Option is provided for uploading xml. 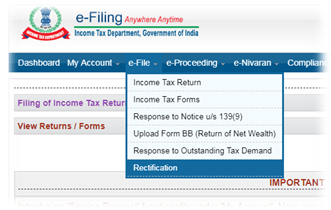 ‘Only Reprocess the return’ − on selecting this option, the ITR will be re-processed. No upload of an Income Tax Return is required. ‘Additional information for 234C’ – Nature of income/gain should be provided quarterly basis. 5. Click on “Submit” button. On successful validation, the rectification return is uploaded and success message is displayed. I am an individual with many sources of Income. Determine whether the given Income will be taxable for me or not in India if I am a resident or Non-resident or Resident not ordinarily resident. Interest on UK Development Bonds, 50% interest received in India, rest 50% in abroad. Fully taxable 50% received in India taxable. 50% received in India taxable. Dividend from British Company received in London. Fully taxable Not taxable. Not taxable. Income from house property in London deposited in a Bank at London, later on remitted to India. Fully taxable Not taxable. Not taxable. Interest on debentures in an Indian company received in London. Fully taxable. Fully taxable. Fully taxable. Long term capital gains on sale of asset at Germany, 50% of profits are received in India. Fully taxable. 50% received in India taxable. 50% received in India taxable. Income from property situated in Pakistan received there. Fully taxable. Not taxable. Not taxable. Mr Shahrukh khan is a Resident not ordinarily resident for financial year 2018-19. He sold some shares of Indian Company but received the amount in Germany. What will be the taxability for the capital gains? Transfer of capital asset situated in India. Will be treated as Income for all categories of taxpayer’s i.e. Resident, Non-resident, and Resident not ordinarily resident. In the given case, the shares are of Indian company and also there is a transfer of capital asset i.e. shares of an Indian company situated in India. Hence the capital gains income will be taxable in India for Mr Shahrukh khan. Mr Salman Khan left India for the first time on 5th September, 2018 for vacation in London. Whether he is a resident of India for financial year 2018-19? for 60 days or more in the relevant previous year. In the event an individual leaves India for employment during an FY, he will qualify as a resident of India only if he stays in India for 182 days or more. This otherwise means, condition (2) above of 60 days would not apply to him. Has stayed in India for at least 730 days in 7 immediately preceding the previous year. Therefore, if any individual fails to satisfy even one of the above conditions, he would be an RNOR. In the above case , Mr. Salman Khan is not leaving India for employment hence he is eligible for both conditions . In the given case, Mr Salman khan has stayed in India for 158 days in financial year 2018-19. However he satisfies the second condition i.e., he has stayed in India for 60 days or more in the financial year 2018-19. Since, he is leaving India for the first time, which means he had stayed in India for more than 365 days in preceding 4 years. Now, it has to be determined whether he is a ROR or RNOR. As it has been mentioned he is leaving India for the first time, he is a resident of India for atleast 2 out of the 10 years immediately previous years and also he has stayed in India for atleast 730 days in 7 immediately preceding years. Hence, Mr Salman khan is a resident and a ordinarily resident. The taxability differs for each of the above categories of taxpayers. If an individual qualifies as a resident, the next step is to determine if he/she is a Resident Ordinarily Resident (ROR) or a Resident Not Ordinarily Resident (RNOR). In the given case Mr Aditya is leaving for USA for employment. Hence only first condition will be applicable to him i.e. he should stay in India for a period of 182 days or more to be qualified as a resident. For the financial year 2018-19, Mr Aditya has stayed in India for 162 days i.e from 1st April, 2018 to 9th September, 2018 which is less than 182 days. Hence Mr. Aditya will be considered as a Non-resident for financial year 2018-19. Only Income earned in India i.e Interest on bank deposits or Savings bank account , any capital gains from asset in India etc., by a non –resident is taxable in India as per Income tax laws. Income earned abroad i.e salary in the case of Mr Aditya earned in USA will not be taxable in India. Hence, Salary or any other Income earned in USA will not be taxable in India. The Senior Citizens Savings Scheme (SCSS) is primarily for the senior citizens of India. The scheme offers a regular stream of income with the highest of safety and tax saving benefits. Senior citizens of India aged 60 years or above. Retirees who have opted for the Voluntary Retirement Scheme (VRS) or Superannuation in the age bracket 55-60. Here the investment has to be done within a one month of receiving the retirement benefits. Retired defense personnel with a minimum age of 50 years. HUFs and NRIs are not allowed to invest in this scheme. Safe and Reliable: Since its an Indian government-sponsored investment scheme and is considered to be one of the safest investment options. Good returns: At 8.6 % the return rate is very good as compared to a savings or FD account. Tax benefits: Tax deduction of up to Rs 1.5 lakh can be claimed under Section 80C of the Indian Tax Act, 1961. Flexibility: The tenure of this investment scheme is flexible with an average tenure of 5 years which can be extended up to 3 additional years. Leave Travel Allowance (LTA) is a type of allowance which is given to an employee from his employer to cover his travel expenses when he is on leave from work. Sometimes it is also known as Leave Travel Concession (LTC). LTA is exempt from tax u/s 10(5) of Income Tax Act, 1961. Under Rule 2B, exemption will be available in respect of 2 journeys performed in a block of 4 calendar years commencing from the calendar year 1986. Where such travel concession or assistance is not availed by the individual during any block of 4 calendar years, one such unavailed LTC will be carried forward to the immediately succeeding block of 4 calendar years and will be eligible for exemption. The current or on-going block year is 2018-2021. A deduction to the extent of Rs. 25,000 is allowed in respect of premium paid to effect or to keep in force an insurance on the health of self, spouse and dependent children. A further deduction up to Rs. 50,000 is allowable to effect or to keep in force insurance on the health of Senior Citizen Parents (above 60 years) of the assessee. Hence the assesse can claim a deduction for both premium paid. Cash gifts are taxable under Section 56(2)(x) if the aggregate value of such sum of money received during the year exceeds Rs. 50,000. Gifts are taxable under the Income Tax Act, unless they fall under the category of exemption. Hence, if the aggregate value of gifts received during the year exceeds Rs. 50,000, then aggregate value of such gifts received during the year will be charged to tax.​ The gifts should be duly disclosed in ITR and taxes should be paid on them.